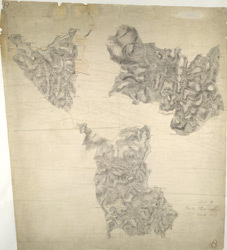 This drawing shows three separate landmasses on the north coast of Cornwall. The area comprising Trevose Head and the estuary of the River Camel at Padstow is drawn at a scale of 2 inches to the mile, as is the inland region south of Tredinnick and Saint Breok Downs to Roche. The area from Hensbarrow Downs to Luxulyan and Saint Blazey is depicted at the larger scale of 3 inches to the mile. The drawing is attributed to Robert Dawson (1771-1860) who represented relief by shading in short disconnected lines drawn in the direction of the slopes - a technique known as hachuring. Dawson also estimated altitudes in pencil, depicting highpoints of almost 20 metres at Saint Breok Downs. Pencil intersections spread from the upper-left landmass, indicating lines between fixed points used for triangulation. Dirt marks remain where the map was formerly folded in four. Plans were not stored flat between deal boards until the1820s.